The United States Congress designated the Beaver Dam Mountains Wilderness (map) in 1984 and it now has a total of 18,667 acres. Arizona contains approximately 15,000 acres. Utah contains approximately 3,667 acres. It is managed by the Bureau of Land Management. The jagged mountains and gently sloping alluvial plain of Beaver Dam Mountains Wilderness straddle the Arizona-Utah border. Management of the Wilderness is shared by the BLM in both states. It is further divided into northeastern and southwestern units by Cedar Pockets Road, which is not in wilderness. Elevations in the Beaver Dam Mountains Wilderness range from about 2,000 to 5,000 feet. 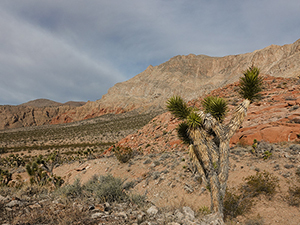 Joshua trees, desert shrubs, and scattered grasses are the primary vegetation. Several rare plant species have also been identified here. Notable wildlife includes desert bighorn sheep, the endangered desert tortoise, and large numbers of raptors. The woundfin minnow and Virgin River chub (endangered species) live in the Virgin River, which flows through the eastern section of Beaver Dam Mountains Wilderness for approximately 6 miles. River rafters and kayakers have been increasingly attracted to the Virgin River, but water levels can be too low for this form of travel in the fall and winter. Spring runoff and summer thunderstorms can create whitewater rafting and kayaking experiences in this area. Most precipitation comes in concentrated storms that are infrequent and total rainfall averages around 9 inches per year. Winters are mild with temperatures ranging from lows around 20 degrees Fahrenheit to highs around 65. Summer highs are commonly over 100 degrees with lows closer to 85. Backpacking in the Wilderness has seen a substantial increase in recent years. That being said, there are no trails, so hone your cross-country skills before heading out. Planning to Visit the Beaver Dam Mountains Wilderness? How to follow the seven standard Leave No Trace principles differs in different parts of the country (desert vs. Rocky Mountains). Click on any of the principles listed below to learn more about how they apply in the Beaver Dam Mountains Wilderness.